Very well located at the north end of Healdsburg and the beginning of the famed Dry Creek Valley and vineyards, this newly renovated 50’s charmer is a lovely, beautifully furnished and decorated, 1600 sq. ft., 3 bedroom/2 bath ranch house with central heat and air conditioning, awaiting your arrival. 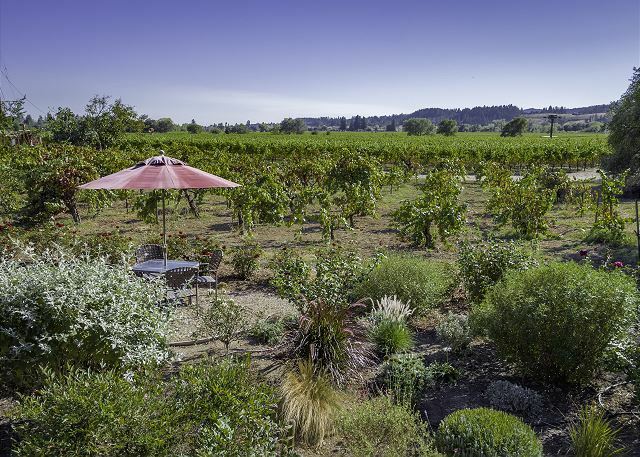 The back redwood deck is surrounded by mature landscaped gardens with seating areas, a new 6 person spa and ‘forever’ views of the vineyards and foothills beyond for your ‘grape escape’. 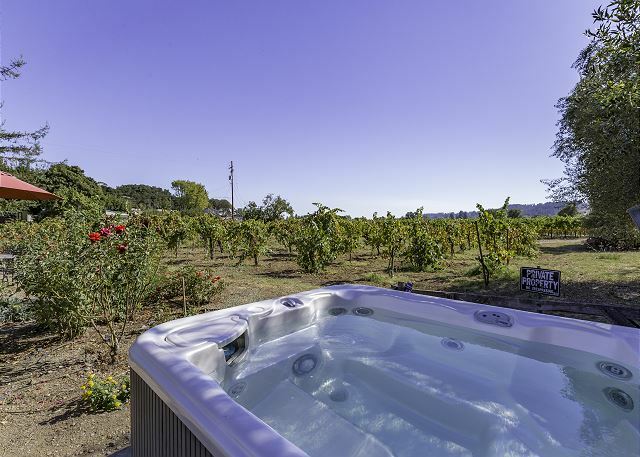 A great ‘home base’ for exploring the diversity of Sonoma County’s ‘Tuscany’ of Northern California, travel west into the Dry Creek Valley and enjoy the many world class wineries with Lake Sonoma’s recreation area just beyond. Minutes to the east lies the Alexander Valley wine growing region, a few miles south the western Russian River Valley vineyards, and yet VineHaven is only minutes from historic upscale Healdsburg’s Plaza with abundant fine dining, tasting rooms, art galleries, shops and more. Enter this special home and you are welcomed by the large living room with beautiful oak floors, plantation shutters covering abundant triple paned windows, crown molding, recessed lighting, a new loveseat and queen size sleeper sofa, coffee table with area rug, and an entertainment center with a 37” Visio HDTV, Comcast cable, DVD player, and whole house WIFI. An open flowing floor plan graces this special home creating a spacious feel with the living room transitioning into the lovely dining area and all new kitchen. Sure to please the chef, this well equipped culinary creation station features a large island with a new 4-burner gas cook top and built-in microwave, beautiful new underlit oak cabinetry, slate floors, all new appliances including a double oven, dishwasher, side by side refrigerator, and new cookware, dishes, flatware, glassware, and just about everything else you will need, but for your vino and vittles. 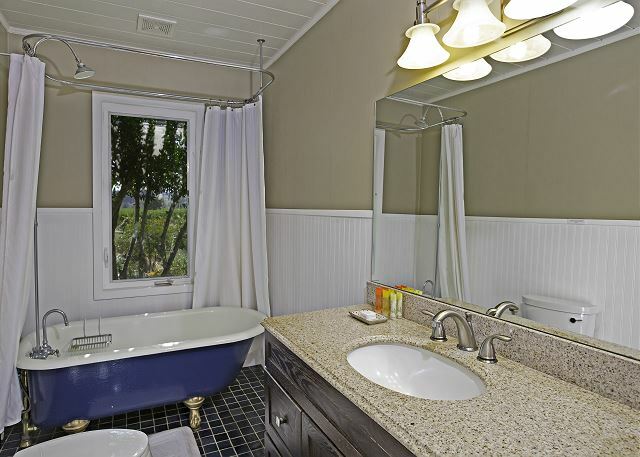 A large double sink with reverse osmosis water available, sits beneath the plantation shuttered window with a beautiful grape vine themed tile trim. With a lovely dining set for 8, this area also has beautiful oak flooring, and full glass double French doors leading to the back deck. Another entry door leads to the master bedroom hallway, at the back of the house, where you will find the indoor laundry enclosure and entry doors to the master bedroom, bathroom and another door to the back deck. The master bedroom is nicely furnished with an oak sleigh queen bed with luscious new linens and bedding, nightstands, lamps, a small chest of drawers, 2 new windows with garden and vineyard views, and double mirrored closets. The bathroom in the master area is private, but can be shared if everyone is in a hurry. 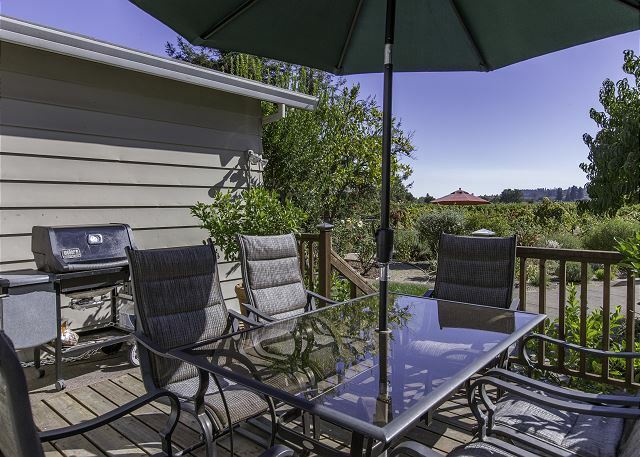 Outdoor amenities include the back deck with an outdoor table with chairs for 6, an additional table for 4 set in the garden near the vineyards, a new 6 person Hotspring spa, and beautiful mature landscaping and gardens on this ½ acre of paradise with forever vineyard views and the foothills beyond. For your grilling pleasure a BBQ is provided on the deck and plenty of parking is available in the long driveway and in front of the house. As referenced, VineHaven is at the beginning of the Dry Creek Valley Wine Trail, and just a few minutes drive west, you are in the middle of the renowned Dry Creek Valley with many award winning wineries including Amista, Dry Creek Vineyards, Dutcher Crossing, Ferrari Carroro, Lambert Bridge, Mauritson, Mounts Family, Preston, Quivera, Rued, Talty, Wilson’s, and Zichini Family, with many more to explore. Again and very importantly, the beautiful Lake Sonoma Recreation Area with marina & boat ramps is only a few minutes further west for water activities, fishing, or just enjoying the beauty of it all. 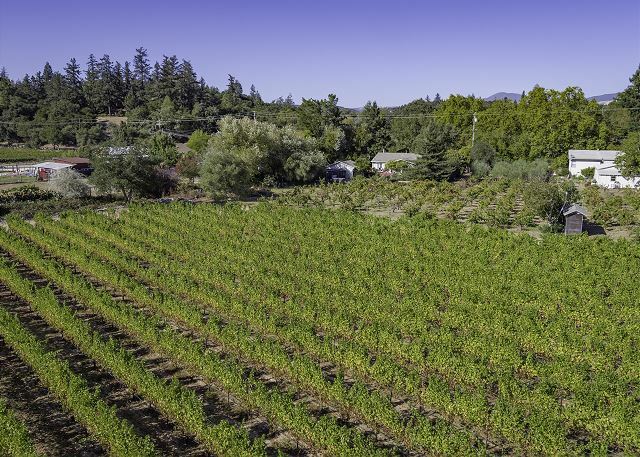 The Alexander Valley wine growing region is just a few minutes to your east, the west Russian River Valley, about 20 minutes south and west and do not forget about the gorgeous rugged Sonoma County Coastline. Not far from town, quiet location, had everything we needed. House is very well stocked, and very comfortable. Management company is very attentive and easy to communicate with during our stay. Would highly recommend this house, we'll be back!!! We had a great time staying here over the Thanksgiving holiday. Perfect layout for our family of 5. Location can't be beat...close to some of our favorites, Truett-Hurst, MacRostie and so many more! 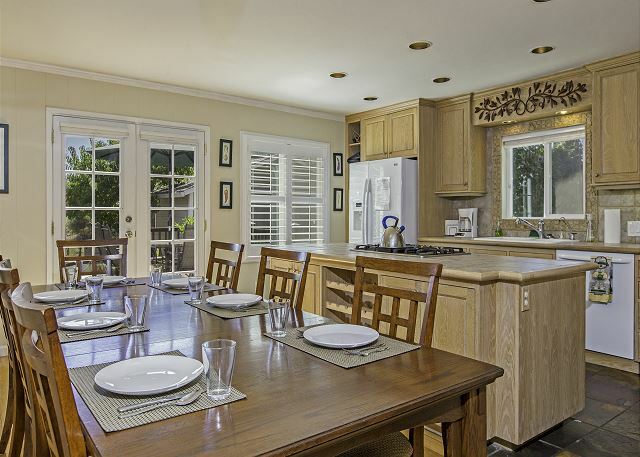 Home very clean, beautiful gardens, kitchen well-stocked and so close to the Healdsburg Plaza. We plan to return! Magical weekend!!! The house was so perfect for my great friends and family!! We are so happy to here you had a wonderful time! We wish your daughter decades of bliss!!! Perfect in every way. Our first time ever staying in a VRBO. We came up for a family wedding with my 3 small kids and parents. Everyone loved the house, it was very convenient and user-friendly. The sleeper sofa left a little something to be desired, but there was an air mattress we used instead. We rented the house in order to attend a class reunion. It was super close to the vineyard where the reunion took place so we loved the location. We had an issue with the C02 alarm and they were very responsive. The info prior to and after the rental time was superb. I really like the management firm personnel. But the house itself had a few issues. The kitchen wasn't well stocked. There were off things like 7 dishes (?? ), super small cutting boards, etc.. There were holes in the screens when we tried to open the windows to get fresh air in. (Check the kitchen window next to the fridge, for example) The wall paper in one of the bathrooms (Back one) is peeling off in a number of places. The patio furniture was rusted (see base of umbrella stand, table, some chairs, etc.) and worn/torn in places. There were spider webs everywhere on the outside patio area along the stairs and all the wooden slats on the patio which I cleaned up so we could walk around out there. The tables outside were super dirty (I had to wipe them down before we could sit at them). I know this backs up to a vineyard which is lovely but I think paying a little attention to clean up outside immediately prior to someone renting the house would have been appreciated. If I recommended this house to a friend I'd be sure to note these items to be sure they were comfortable with them for the price. Amazing property. Had a great stay in the Healdsburg area. Highly recommended. The house was a perfect size and location. We loved playing cards around the large dining room table, cooking dinner in the kitchen, using the BBQ on the back patio and relaxing in the hot tub. Drinking a glass of wine on the back patio whike looking at the beautiful vineyard was perfect. We had a great experience here and would definitely recommend it to others. Had a wonderful time in the Wine Country while staying at Vine Haven. Location was ideal in Healdsburg to visit wineries in the area, and the house with 3 bedrooms was great! Spacious rooms and updated interior throughout. We had a lovely stay in Healdsburg at Vine Haven. The home is comfortable and roomy with all amenities in place. I had some technical issues with getting the contract signed properly; communication could have been better by the management team but the property is lovely. My girlfriends and I had a great stay at Vine Haven. 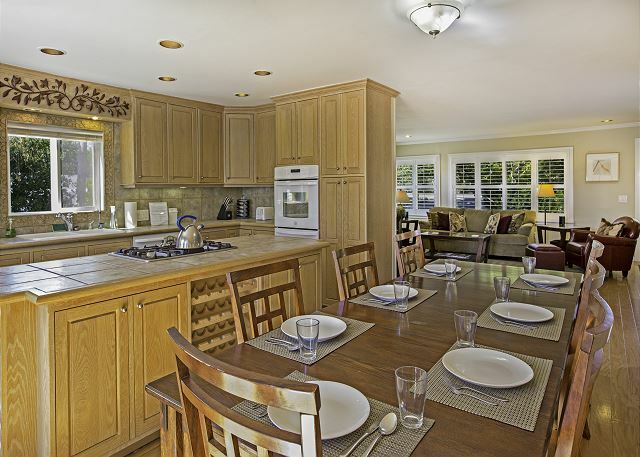 The house was clean, well stocked with towels, etc, and a convenient location to Healdsburg downtown area. The hot tub was clean and lovely! Would definitely stay there again!